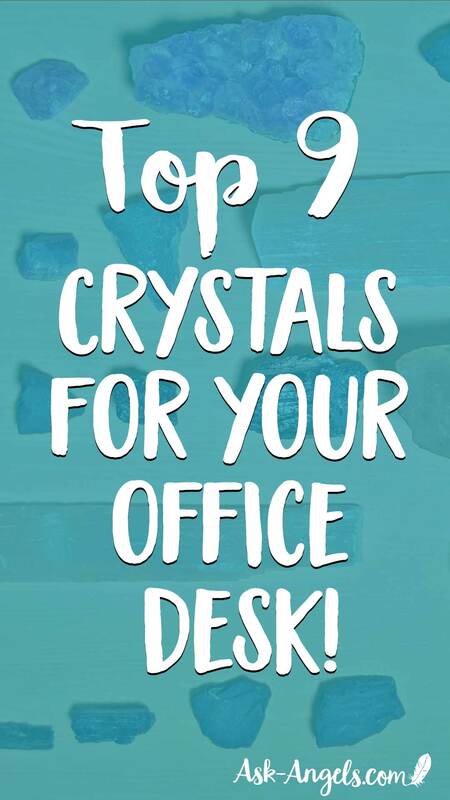 Raise the Vibration of your Workplace by Keeping Crystals on Your Office Desk! 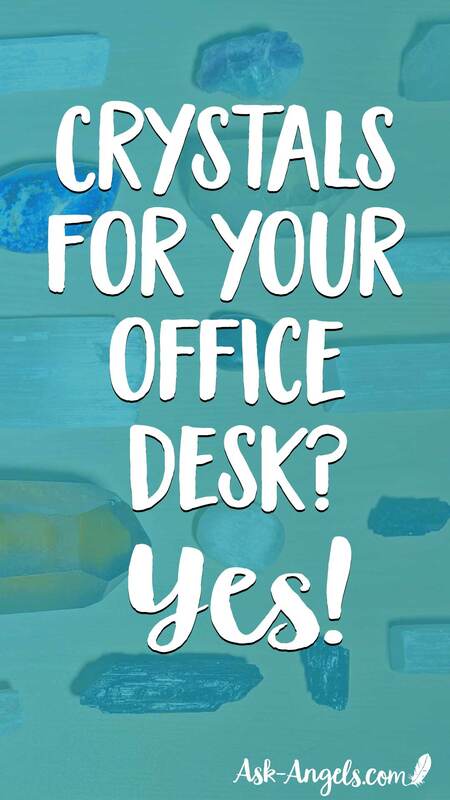 Do you keep crystals on your office desk? If you’re looking for a way to increase your productivity, abundance, or even heighten your creativity and promote inspiration, maintain a high vibration at work, open the lines of communication, increase the flow of …? You guessed it… Crystals can help! New to Working With Crystals? No Problem! If you’re completely new to working with crystals, don’t worry. 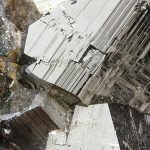 Crystal energy is incredibly powerful, beautiful, and yet its also really accessible for just about anyone to start tapping into. While there are some best practices when it comes to working with crystals, there’s no steep learning curve or pitfalls you need to avoid to get started. Crystals work simultaneously on many different planes of awareness. They each vibrate with a consistent energy, and with harmonious Divine qualities, and a coherent crystalline frequency. Just having them around helps you to connect with their Divine qualities through subtle energy… Or you can connect with them on an even deeper level to invite more of their positive energy into your consciousness and into your life. So Why Keep Crystals On Your Desk? If you’re like most people who spend time at a desk… You spend a fair amount of time there! 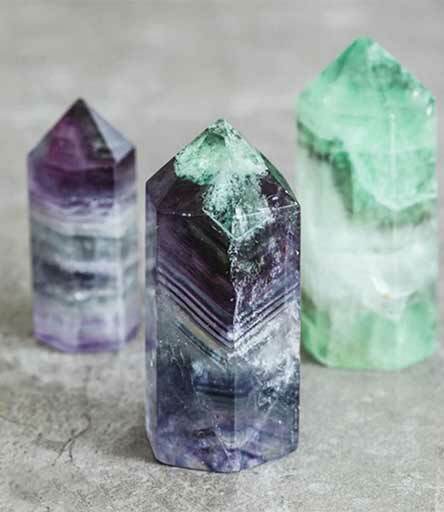 Crystals are a powerful way to help keep your work environment energetically clear and bright, which can help bring a sense of ease and balance into your work life and productivity. 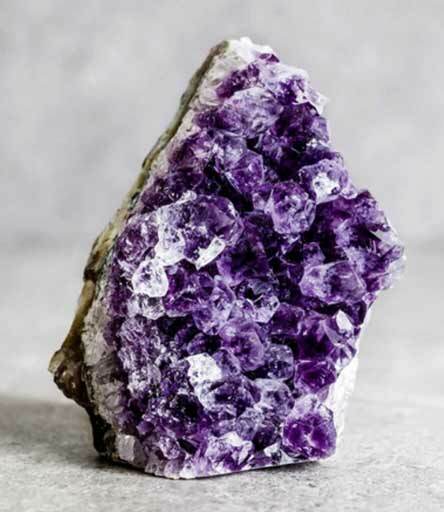 Not only will the crystal placed on your desk support you in manifesting that intention to stay positive and productive by holding those energetic frequencies itself… But by setting an intention in conjunction with your stone, your crystal will also then, serve as a visual reminder for you to stay positive and productive too! When it comes to the properties of crystals, they’re sort of like fruits! They all have their unique characteristics, flavors and properties… And they’re all amazing in their own unique ways, and yet there are probably some which you have a natural affinity for, and you probably have your favorites. Also, depending on the season (and what you’re going through in your life) certain crystals may be more appealing or helpful for you. This is why I always recommend using your intuition when choosing crystals. Your inner sense of guidance and intuition is the best resource for choosing the right crystals for you! I not only have selenite on my desk… I have it placed all around my house! Selenite is an incredible stone for clearing out any negativity, stress, or tension, and raising the vibration of your space with positive energy and light. Selenite is amazing in that it is self-cleansing, and will actually help cleanse and charge whatever additional crystals you place around it! 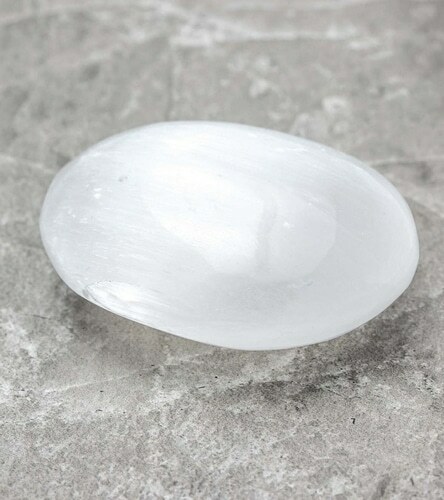 Selenite is also closely connected to the angelic realms and will help you to connect with guidance, healing and inspiration from Spirit. Learn more about selenite here. Let’s face it… Electromagnetic frequencies are a very real thing, and if your work involves anything being online, on a computer, or you have a smartphone, you have EMF’s in your workspace. Shungite is a powerful stone for protection against EMF’s. It is one of the few stones that actually absorbs harmful physical EMF’s… Shungite also serves by strengthening your personal energy field and it energizes whatever additional crystals are placed with or around it. 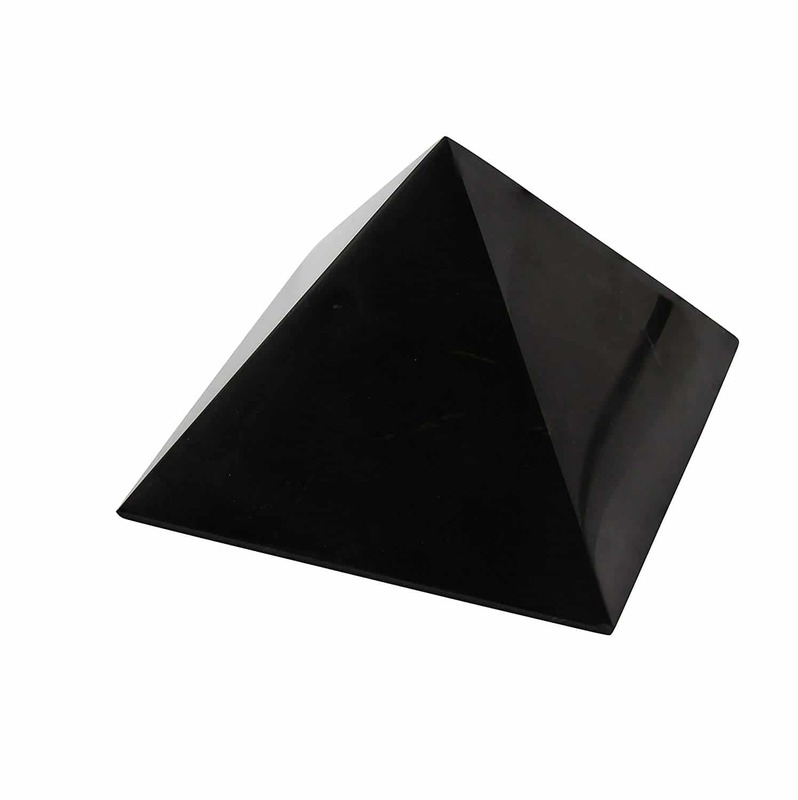 I have this awesome Shungite Pyramid on my desk and I love it! Learn more about shungite here. 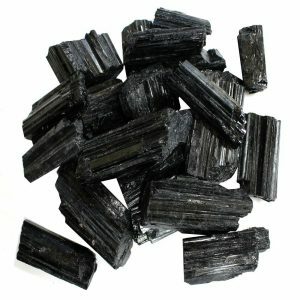 Black Tourmaline is a stone of protection and purification. This incredible stone protects and shields you from negativity in any form including frustrated coworkers, EMF’s, negative etheric energy, drama, psychic interference and more! 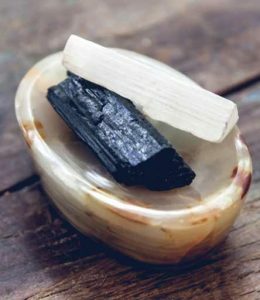 Black tourmaline also assists you in staying grounded and free from self-doubt as it cleanses and transforms any negativity into a higher and lighter vibe. Learn more about Black Tourmaline here. Fluorite is sometimes called “the Genius Stone” because it brings mental clarity and supports both hemispheres of your brain in working together harmoniously. Fluorite also boosts aptitude, promotes learning and discernment, heightens creativity, assists you in absorbing new information, and supports you in navigating complex situations. Sound perfect to have at work? I agree. There are many additional positive benefits of fluorite too. It’s a helpful healing stone, and it can assist you in expanding your awareness, balancing the energy of you and your environment, and it helps to promote clear thinking. Fluorite assists with concentration, self-confidence, and it serves to neutralize stress and negativity so you can stay clear, balanced and centered. Amethyst is incredible. It offers the gifts of spiritual protection, stress-reduction, heightened intuition, and so much more. Amethyst is said to promote logical thinking, while also helping pull your mind away from negative thought patterns and tendencies. It protects against psychic attack, and connects you with your inner spiritual wisdom and heightens intuition. Amethyst also supports clear communication, positive transformation, and is said to support a healthy immune system. All this, and its one of the most well known stones for simply creating a beautiful and uplifting spiritual energy around you. Apophyllite broadcasts a high-frequency light energy which will help to activate your own light, while also soothing stress, emotional turmoil, anxiety and worry. Apophyllite offers powerful assistance in clearing negative psychic debris, and past traumas while assisting you in aligning with your highest authenticity and bringing your inner light to the surface in the present. On your desk, apophyllite acts like a wise spiritual adviser helping keep you on track and in alignment. Apophyllite broadcasts a wonderful energy of healing light, joy, and ease… It is a wonderful stone for meditation, and also just for supporting you in cultivating true happiness, authenticity, and lightness within your entire being. Clear Quartz is highly programmable, and is an amplifier of energy. This is an excellent stone to infuse with your intentions of what you want to create and manifest at work or in your life experience. To program your clear quartz crystal, simply hold it in your hand while you focus on your intention. 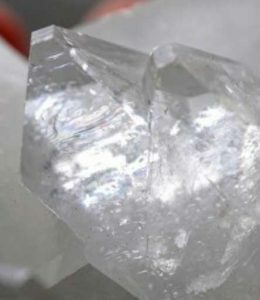 The quartz will then receive your intuition, and amplify the energy around it (just as quartz does when used in computers and other technological devices). 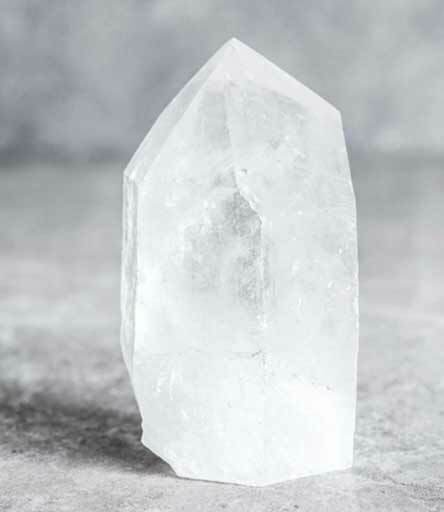 And yet, even without your intention, clear quartz has so many wonderful properties including promoting clarity, clearing energy blockages, expanding your consciousness, and bringing about powerful healing. Citrine is incredibly well known to be a stone of abundance, but its also a stone of light and happiness. Most of the bright yellow citrine you find is actually heat-treated amethyst, which is still a powerful stone… But I personally prefer natural smoky citrine, and have an incredible smoky citrine point I like to keep on my desk. 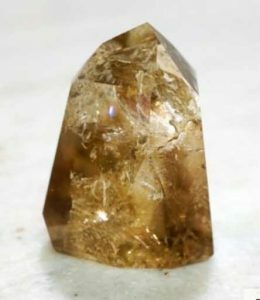 Order this smoky citrine point now! Smoky citrine supports you in manifesting your intentions and attracting success, prosperity, and abundance. It’s also energetically protective, and aligns your willpower with your intentions. Connected to the Golden Ray, smoky citrine assists you in bringing light and golden energy into your body, mind and spirit… This is a wonderful stone to pick up at the start of your day, and just feel yourself completely surrounded with Divine light, love and incredible energy. If you want to bring about true joy, lasting fulfillment, ascension energy, and incredible abundance… Definitely consider working with the crystal energy broadcast by citrine! Lapis Lazuli is a combination of Lazurite, Calcite and Pyrite so it carries the characteristics of all these stones, plus a beautiful new energy the combination creates. This is a stone of spiritual enlightenment that will support you in awakening your highest life path and soul's calling. 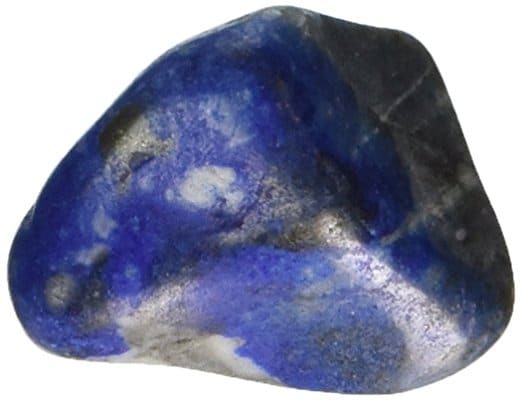 Lapis Lazuli is also powerfully protective against any kind of psychic energetic interference, and has a magical way of dissipating stress and promoting inner harmony and peace. Lapis supports you in heightening your intuition, promotes self-confidence, reveals your inner truth, inspires love, friendship and inspires you to speak your truth. It also stimulates creativity, clarity and has a way of cutting through clutter so you can more objectively view situations or challenges. Lapis Lazuli is also a powerful stone of manifestation, especially for manifesting your highest calling and true soul work and contribution. Let The Right Crystals For Your Workplace Choose You! When it comes to choosing the right crystals for you space your intuition is key! Remember that crystal energy is incredibly multi-faceted… And just because a crystal is most well know to have certain properties, that doesn’t mean there’s not a whole expanded list of meaning and what it can help you with! If you have a local crystal shop near you I recommend going in, and just allowing yourself to look around and notice which stones call out and seem to speak to you. The right crystals for you absolutely have a way calling out to you, and appearing in your life! P.S. If you work somewhere like a bank or a grocery store and you're not able to place crystals on your desk… Consider wearing any of these stones to support your energy and promote a harmonious environment with crystal jewelry instead! Top Crystals For Travel – Don't Forget to Pack These! Thank you, Melanie, for the wonderful new post! I totally agree with you, the crystals are the living beings with their own conscience. They know when we need them, and the right crystal will enter our life at the right time. I went to the market recently to get some plants and ended up coming back with a crystal instead. The crystals are enigmatic, powerful and incredible! Thanks once again, dear Melanie, loved your post, it really resonated with me! Great informative post! I will be putting some of the crystals mentioned here at my work station. Yay! Glad to hear you enjoyed the post… I’m sure you’re going to love the addition of crystal energy at work!